In the wake of the Brexit business, I have been thinking all week of a wonderful couple who live on the east side of the River Foyle in Derry. They run an outstanding B and B – and supplied the best full Irish breakfast we had. They were “Irish” living in a 50/50 area. The husband had run various pubs on the west side of the Foyle for some years and had also worked for British Olivetti (he told a story of how the fact his British sounding name and the fact he worked for a British company had saved his life in a Unionist Belfast pub). 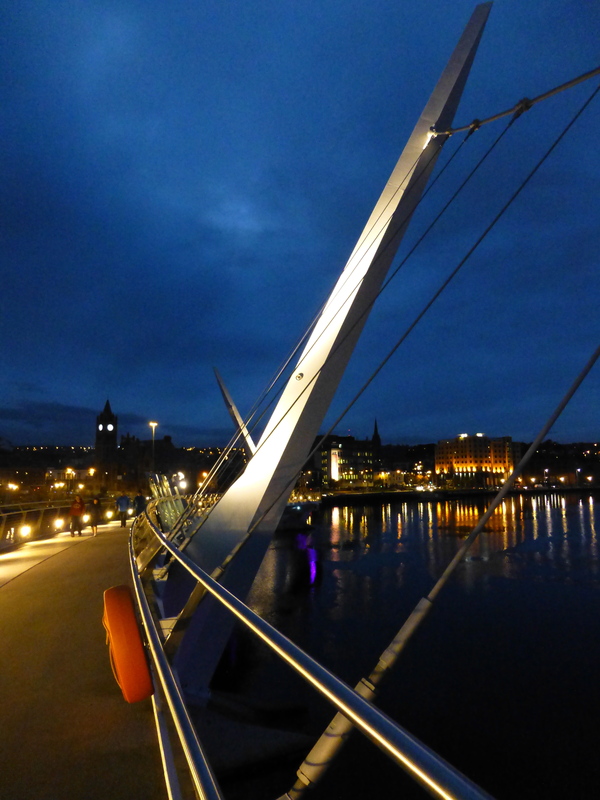 The couple were proud of what Derry was becoming – a peaceful place with a bright future. So were the Irish speaking couple, one of whom lived and worked in Derry, the other in Donegal, whom we met in an “Irish” pub (as in, for those of Irish background) in Derry. This in a town still where the police still used armoured trucks, carried machine guns and there was barbed wire around the Gaelic football grounds. But there was still a huge feeling of hope. The symbol of that future was the Peace Bridge, connecting the west and east sides of the Foyle. It was half funded by the EU, as part of its commitment to the ongoing peace process. There were many who speculated that not many would use it – as many generations of the “English” hadn’t wanted to go to the west side. But by the time we went there in 2012, plenty were using it every day to walk or cycle. Or just be there. Here’s my original post from 4 years ago. 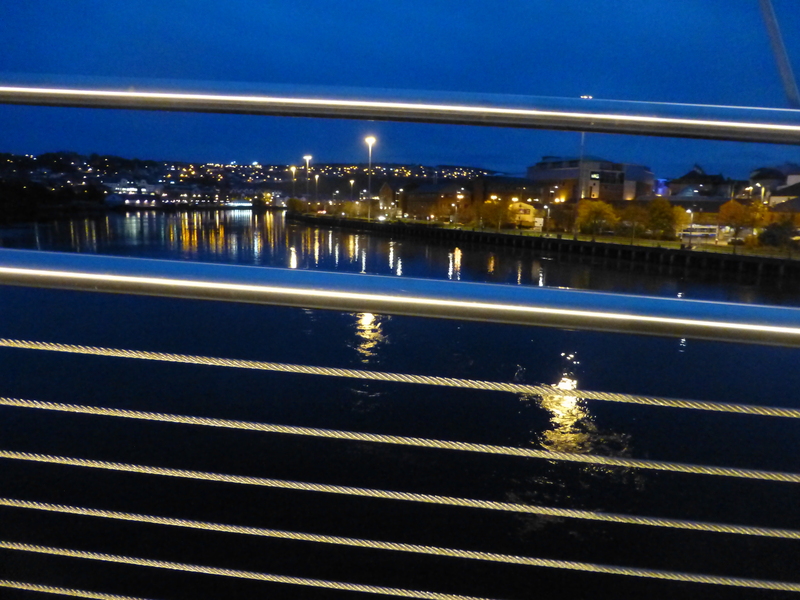 Across the River Foyle, £15 million was spent on a bridge that was built between two quite different communities. On the west side of the Foyle has the city centre, but also an almost entirely Catholic community – including the well known Bogside area, which, amongst other events, experienced Bloody Sunday. On the east side, the community is roughly 50 / 50 Catholic / Protestant. There were objections raised, communities questioning whether people from both sides would cross to the other, the cost, the name. Fortunately for the city, all barriers were overcome and the bridge has been built. 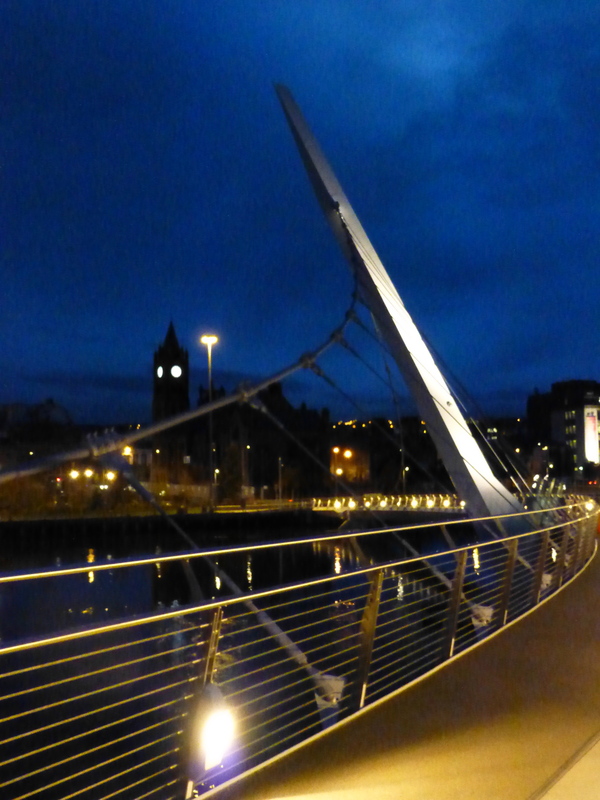 In a city as contested and troubled as Derry / Londonderry has been, such a project has become a symbol of the optimism and the movement of the city to a new era. It has, for a start, witnessed a large increase of people wishing to cross from the east over to the west, either by walking, running or on cycle. When I was there near sunset, there was a lot of foot traffic. Our wonderful B and B hosts (from the East Side) also told us about the pride people had for the bridge. We could see why. The design has helped with the success of the bridge for the community. Its curve and seats have been crucial for its stunning look and encouragement to sit and enjoy the river and surrounds. 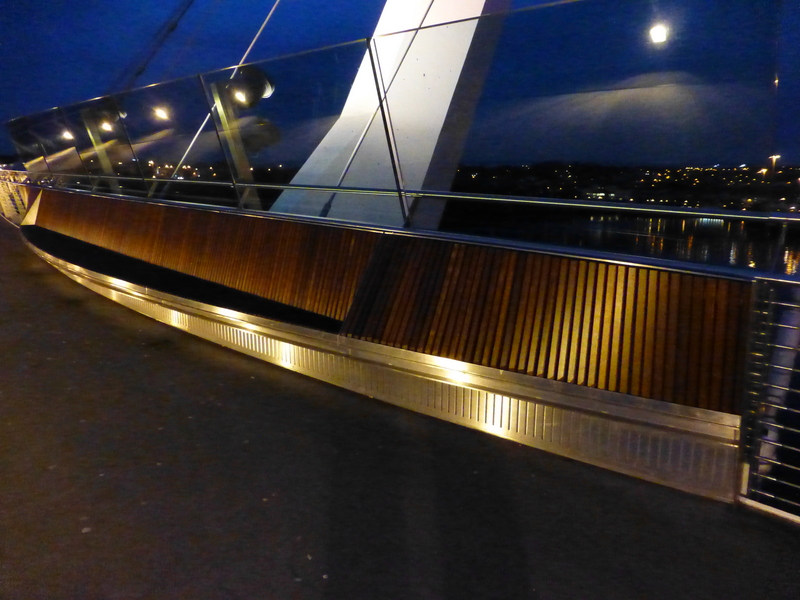 Also important are the seats – the Peace Bridge has two long seats, ideal for sitting and enjoying the view. During the day, the view is beautiful too. The Peace Bridge is rapidly becoming a tourist attraction by itself – and so it should. Like the city of Derry / Londonderry, it represents how people can rise above adversity and have a new, interesting future. Bridges can inspire and act as a magnet to an area. 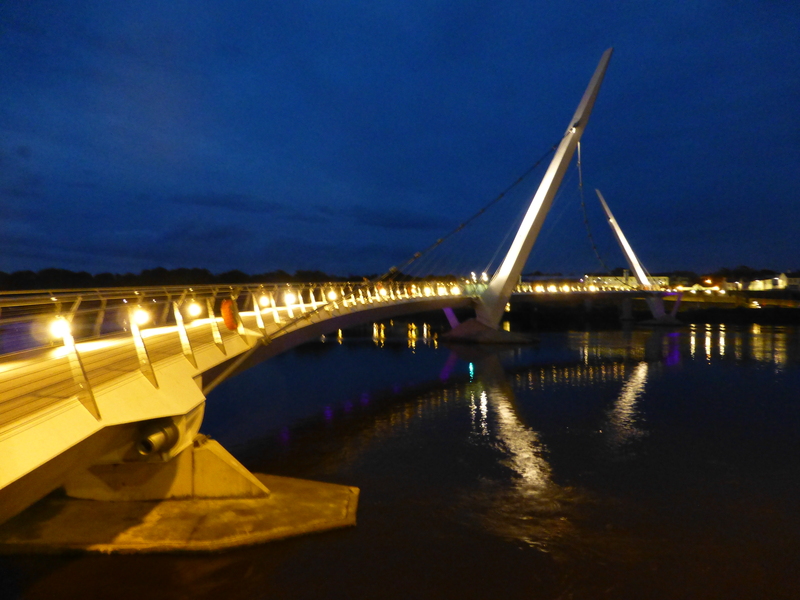 The Peace Bridge in Derry is one such project. But now, due to some insular nonsense sparked from all the way in London, all of this hope may just evaporate.